The Caribbean islands in the direct paths of Hurricanes Irma and Maria weathered two instances of Category 5-level winds and rain in just over a week. The storms have ripped off roofs, leveled neighborhoods and prompted mass evacuations. Dominica, Barbuda and the Virgin Islands — which are already dealing with high rates of poverty — were hardest hit by the back-to-back hurricanes, and face a long road to recovery. There's not a single living person on Barbuda for the first time in 300 years. The island evacuated all 1,800 of its residents, and 95% of homes and buildings are destroyed. Maria made landfall in Dominica this morning, packing 160 mph sustained winds. That's stronger than Harvey and Irma when they hit Texas and Florida, respectively. Parts of the Virgin Islands and Puerto Rico could be "uninhabitable for months" after Maria strikes, per NBC. 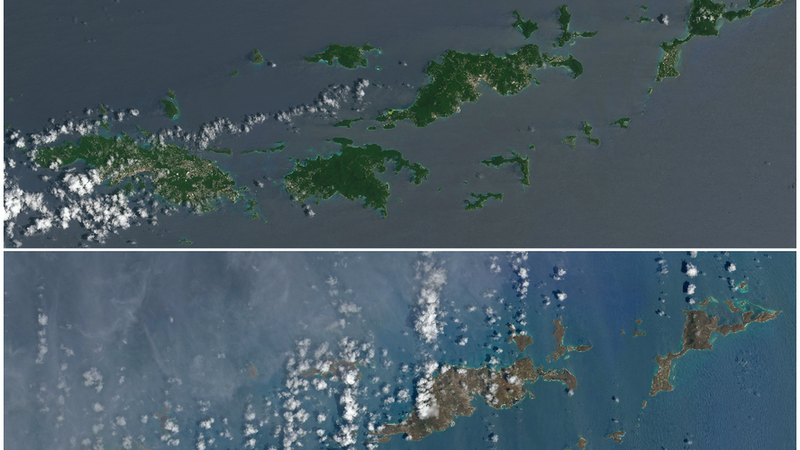 As the above natural color photos shot by NASA show, the hurricanes ripped so many plants out of the ground that the Virgin Islands appeared to change color. "Lush green tropical vegetation can be ripped away by a storm's strong winds, leaving the satellite with a view of more bare ground. Also, salt spray whipped up by the hurricane can coat and desiccate leaves while they are still on the trees," per NASA.